It seems to me that Runners World is kind of a badge of honor for most runners. Can you call yourself a runner and not subscribe to Runners World? I’m actually not sure. The ironic part of the whole thing is that I don’t know anyone who actually reads the thing cover to cover. 1/3 of the articles are total fluff, 1/3 of the articles are a re-written version of the same article from last month’s issue, and only about 1/3 are truly interesting articles I enjoy reading. 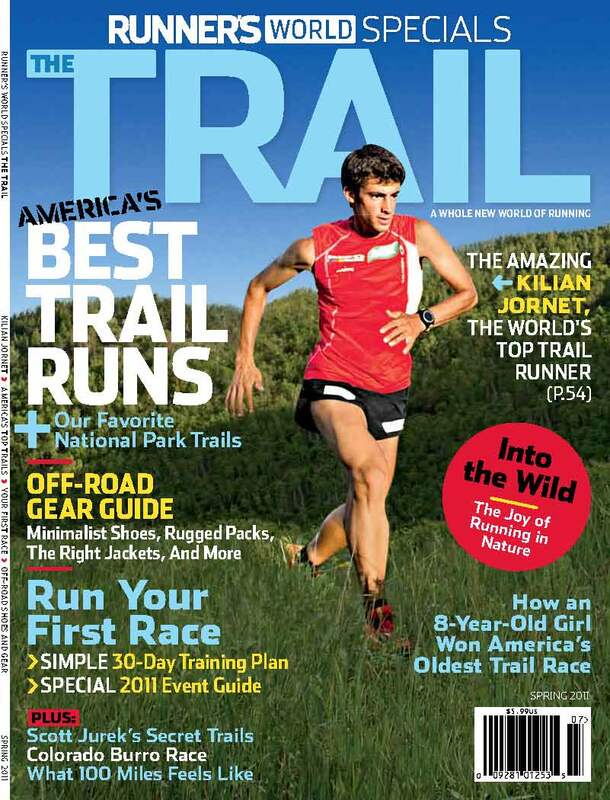 That being said, I was excited to see that this month would bring a Trail Edition, which was bound to offer a variety of new types of articles, interesting stories, mind blowing trail pictures, and shoe reviews I’ve been looking forward to. The edition didn’t really disappoint, offering all of those things, and making me very jealous I don’t live in a place that offers better singletracks. I don’t subscribe to Runner’s World. Am I not a runner? haha, no. I think it makes you a smarter runner. I was complaining to my dad that in every damn issue of Runner’s World, it seems like half the magazine is a section demonstrating dynamic stretching or yoga pose core workouts, and he’s like “yeah, that’s my favorite part”…..I thought it was universally loathed. Different strokes for different folks i guess. I also desperately miss Rock Creek. Running’s good in Madison, but for city running, I’ll take the DC paths and terrain (though not the summer weather).